On the Notifications page, click the “Date Processed” column heading. This will bring all your unprocessed IPNs to the top of the list. IMPORTANT: You should not be in a position of having many unprocessed IPNS. SubscriptionBoss tries to reprocess all unprocessed IPNs every time a payment comes in. So if you have old unprocessed IPNs you should process them manually on Infusionsoft then delete them from SubscriptionBoss. Normally PayPal IPNs are processed automatically when they arrive. 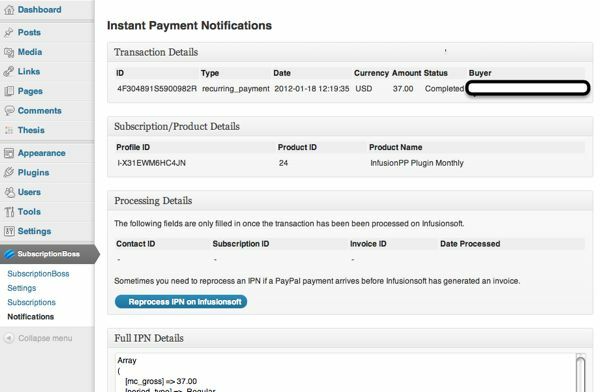 However, the arrival of the payment from PayPal can sometimes arrive before Infusionsoft has generated the invoice. In this scenario the payment cannot be matched against as an invoice as the invoice does not yet exist so the payment remains unprocessed. When the next payment comes in (and this may be for any client) then the plugin makes an attempt to reprocess all unprocessed payments. By this time the invoice may exists and if so the payment will be processed. However, maybe you do not want to wait for the next payment. In this case you can select the IPN and then click the reprocess IPN button. If the IPN is processed successfully the ‘processed’ date is filled in, as is the contact ID, Subscription ID and the Invoice ID. No Invoice: wait and retry later. No Server: wait and retry later.